Updated June 25, 2008 - Thanks to Maria Beattie who found BMDs. Updated February 3, 2009 - Thanks to Wendy JACK who added new BMDs I also added new (old) photos. Updated February 5, 2010. A total rewrite with new sources added. Updated: Footnote 16, 2010 - court case hyperlink added. Updated: August 30, 2015 Many changes - too many to detail, thanks to input from Carolyn Hendry. If all we had to go on to build a picture of Andrew Bradford OLIVER were the comments by his sister, Eliza, we would have to conclude that he was a very sorry piece of work - a man who was motivated only by whiskey and law. But then again, her version was tainted by the fact that the two of them were locked in a pitched battle over disputes about an inheritance from their brother William. So it is worth starting at the beginning and building a picture of him as best we can from a range of fragments. We don’t have much to go on. 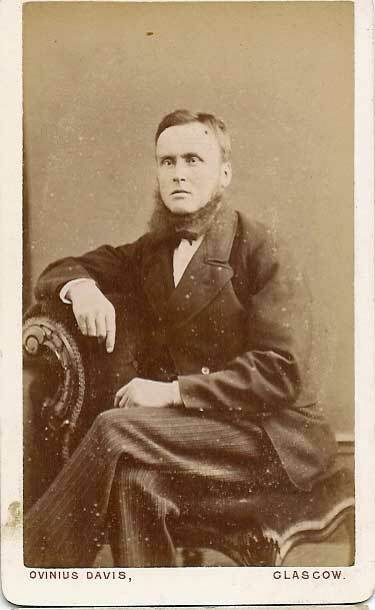 Andrew Bradford OLIVER was born in 1818, in all likelihood at the family home at Killynure, Co. Armagh. He was the second youngest known child of a family of six, the children of Benjamin OLIVER and Elizabeth BRADFORD. Both of his parentes came from reasonably prosperous Presbyterian families whose lives had been supported by both farming and the linen industry. He was only seven years old when his mother died at age 40, possibly of a lingering illness. Her daughter Eliza mentioned in a letter that her mother wished to die, a situation which must have been hard for the children to endure. 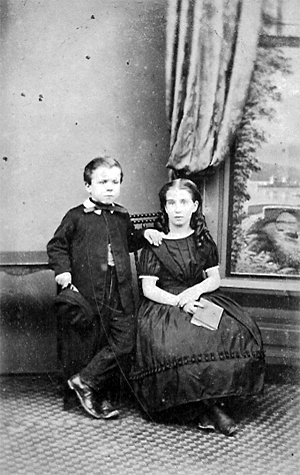 Not only did young Andrew lose his mother when he was a child, but then his father died in 1831. Andrew was only 13 years old at the time, a delicate time for a boy to have lost their only surviving parent. We have no record of who then cared for the dependent children. The two oldest sons would have been old enough to take this on, but it seems that although they were good souls (and bachelors to the end) they were also a bit on the rough and ready side and quite likely fully engaged on the family farm. I suspect that the younger children might have gone to Cavananore to be cared by a maiden aunt, Margaret BRADFORD and their aunt, Mary Jane OLIVER, a younger sister of Andrew Bradford OLIVER. Their great-uncle, Andrew Coulter BRADFORD, was also living at Cavananore at the same time. Andrew’s mother, Elizabeth BRADFORD, had been born at Cavananore. Her family was supposedly given the land after the Battle of the Boyne, although I have yet to corroborate this. Be that as it may, her family had flourished on that land for at least a hundred years earning their keep as “strong farmers” as well as working at other small business enterprises of various sorts and also taking on small-town civic posts from time to time. As an indication of the importance of her roots in Co. Louth, his mother’s life was remembered in a gravestone inscription at the Presbyterian Kane cemetery nearby. If there was also a grave marker near her home at Killynure, there is no record of such. Unfortunately for posterity, the private graveyard where many OLIVERs were buried is now a grazing field for cows. If time and the elements had not already eroded the inscriptions, the hoofs of the cows would have done the rest. As for Andrew Bradford OLIVER, his family is remembered in a grave marker in Lislea. Since this is in a Church of Ireland graveyard, perhaps that was the religious denomination of his second wife. Andrew Bradford OLIVER's father’s family were supposedly of Huguenot stock, although other than oral family history I have yet to prove this. We do know that the family farmed in the area at least as early as the late 1600s. When Andrew was a child, most of the land on either side of the road connecting the City of Armagh to Monaghan between Killynure and the outskirts of the city would have been owned or leased by his OLIVER relations. Through a series of misadventures, ill timed business decisions, the luck of the times and shortage of competent male heirs, it all came a cropper in the years just preceding and just after his birth. It probably didn’t feel great that other families scooped up the leavings (mostly legitimately) and built fortunes on the lands that the OLIVERs had to let go. So, in one way or another, Andrew grew up and followed in his family’s footsteps by becoming a farmer. His first wife died in her early 20s, and on March 22, 1843 at Eglish Parish, Co, Armagh, he married Anne HANNA, the third daughter of William HANNA, deceased of Terraskane [aka Tereskane]. He was 25 years old at the time and she was 21. A John HANNA of Terraskane acted as trustee on her behalf while William OLIVER of Brootally and Andrew Coulter BRADFORD of Cavananore were the trustees acting on Andrew’s behalf. As part of the wedding agreement, William OLIVER and Andrew Coulter BRADFORD made over to James HANNA 25 acres, 3 roods 10 perches in Brootally, Parish of Derrynoose, Co. Armagh. This land had been included earlier in a November 1, 1828 in a lease by Maxwell CLOSE to the OLIVERs. A second parcel in Brootally included another 4 acres, 2 roods. A third parcel included 18 acres 2 perches in Killylea, Parish of Tynan, Co. Armagh held by a James OLIVER. This latter holding recited a lease on August 15, 1830 between Sir James Maxwell STRONG, Henry Samuel CLOSE and John Tew ARMSTRONG (executors of John MAXWELL of Fellows Hall) and William OLIVER. By the time of Griffiths Valuation, it appears that James OLIVER had sold his acreage and moved in to the Village of Killylea where he leased a house valued at £1.15.0 (looking at a map, I believe this would have been row housing of a fairly decent quality). He died about this time. Interestingly, given the name that Andrew would choose for his first daughter, there was also a Martha OLIVER who leased lands at Killylea as well. I know nothing more about the HANNA family other than the fact that in Griffiths, a Samuel HANNA had clear title to about 15 acres and buildings valued at £2.0.0 at Terraskane and also leased an additional 22 acres and buildings valued at £2.15.0 there. Also, a Jemima HANNA leased about 32 acres and buildings valued at £7.10.0 at Ballyscandal as did a Samuel HANNA who leased a further 8 acres, 3 roods 22 perches there. This is the townland where both Andrew and his wife would live out at least part of the latter part of their lives. The townland of Terraskane is on the eastern border of Ballyscandal, so I suspect the family farmed in both townlands. Andrew Bradford OLIVER and Anne HANNA had at least 5 children. Two of them, Mary Jane and Barbara died in infancy. Their first born, Martha Eliza, was probably born in early 1844. By age 19 or so, she had already emigrated to Queensland, Australia. I do not know under what circumstances she emigrated or when. I suspect she was slightly south of the legal age of 21 when she married and hence fudged the date for her marriage certificate (on February 20, 1864). She and husband George NORRIS had three children (George, William (b. 1868) and Mary Jane (b. 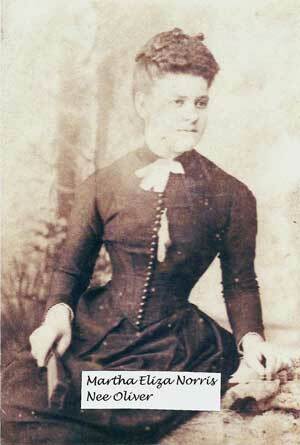 1869)) before poor Martha died November 26th, 1872 at age 28 from peritonitis. Her aunt Mary Jane OLIVER, who died three years later, took care to bequeath £100 to her four year old daughter Mary Jane NORRIS. This photo was contributed by Ruth Murdoch of Australia. This is her great-great-grandmother. Martha Eliza OLIVER was married at age 17, had three children and had died by age 25. This picture was possibly taken just before she left Ireland. Check out the waistline! NOTE: The rest of the NORRIS Family tree (deceased descendants only) can be found at my "Silver Bowl" family tree at Rootsweb. I do note that an earlier generation of OLIVERs in Ireland also intermarried with an Irish NORRIS family, so although George was born in England, it is hard to say how long his family had been there and they may have also come from Ireland. This photo was contributed by Ruth Murdoch of Australia. 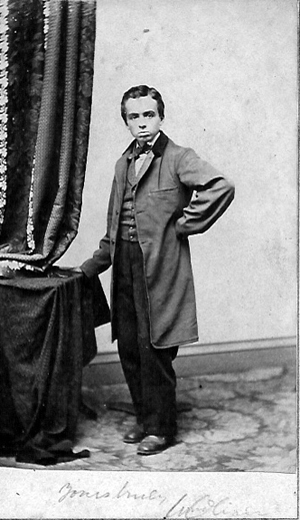 Benjamin OLIVER was the eldest and possibly only son of Mary Jane HAYES and Andrew Bradford OLIVER. He was mentioned in a letter June 8, 1874 when Eliza OLIVER is telling her son Thomas about her brother Andrew’s attempts to get some of the family land (this may have included Killynure). On July 16, 1880 the OLIVER estate was sold for £2,350, much to the surprise of Eliza OLIVER. Her brother William had died 7 years earlier in 1873. She thought they might contest the outcome, but also realized that it could take another seven years and would incur more legal costs. According to Thompson BROWN, the property in the estate had never been legally deeded and hence he suggested that a Benjamin and a John OLIVER should get 1/3 of the property. Benjamin was left money in the will of Mary Jane OLIVER (his aunt); he is not mentioned on the family headstone (which mentions the deaths of other children as well as the death of their mother in 1891); and he does not show up anywhere in Ireland in the 1911 census. Since I first wrote this biography, new DNA evidence and correcpondance from descendants of Benjamin OLIVER have shed new light on the picture. Although his picture was in the same family album (CD1) at Gilford, it was not on the same page. The other members of this family were grouped together. His photo was on a page with Tom MOONEY,S.E. McCORMICK and Mrs. McCORMICK . NOTE: I keep switching him in my rootsweb tree between being a son of Mary Jane HAYES or else a son of Anne HANNA. Until I find a birth date, I cannot be sure. He does bear a family resembalnce to his younger brother (or half-brother) Bradford OLIVER. 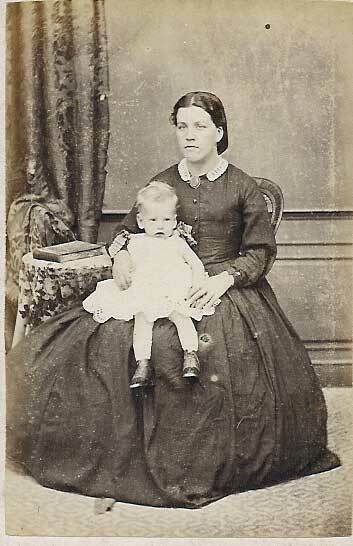 Finally, the second youngest of their children is Margaret who was born in 1853 and died at age 28 in 1881at Aughrafin. Parish of Eglish. I have no idea who she may have been living with at the time, if anyone. Her father had died at Aughrafin 4 years earlier, so it is possible that her mother still maintained a home there. By the time of Griffiths Valuation, there is no remnant of any known OLIVER family connection to this townland. Margaret’s will was probated by Thompson BROWN of Killynure, a son-in-law of her Aunt Eliza OLIVER. She left an estate of £364.5s.8d.. 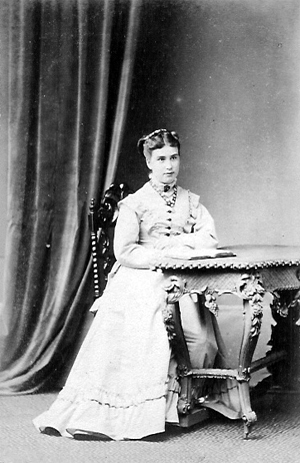 Some of her personal wealth had been topped up by a bequest from her Aunt Mary Jane who studiously avoided giving money to the fathers of her nieces and nephews – and her bequests went to the children directly. In the picture beneath, she is probably about 12 years old. When I look at her picture and wonder about her life, I notice that she would have been the same age as her cousin, Margaret JACKSON. Hopefully, they had some happy times together playing at Urker, Cavananore, Killynure or other family homes. This photo is undated, but Margaret looks here to be in her late teens, early 20s. So, once again we see a fairly large family, the 7 children of Andrew Bradford OLIVER and Anne HANNA, and out of all of them only two lines produced known descendants - the NORRIS family in Australia, and the descendants of Benjamin OLIVER is Scotland, Canada, and USA. Their descendants are amongst the ones who provided much additional information that made this page possible. Andrew Bradford OLIVER died at age 59 at Aughrafin, Killylea, Parish of Tynan, Co. Armagh, His wife, Anne HANNA, died on March 29,1891 at age 69. She had outlived all but one of her children. Her effects were £90.10. WILL PROBATE: 1891 Anne OLIVER late of Ballyscandle, widow d. 29 Mar 1891 at Ballyscandle. Granted to Andrew C.B. OLIVER, son. Effects 90 pounds 10 shillings. HEADSTONE: Sacred to the memory of Andrew Oliver of Killylea who departed this life November Killylea, Parish of Tynan, Co. Armagh. 27th 1877 aged 39 years Also his children William Oliver April 17th 1867 Martha E Oliver December 2nd 1872 Margaret Oliver April 13th 1881 Also Mary J and Barbara Oliver who died in infancy And his wife Ann Oliver died 28 March 1891 aged 69 years. NOTE: The transcription that I first received was incorrect. His alleged age at death of 39 can not be correct as his mother was already dead in 1825. A GRO record showing the same date of death and gives his age as "59" - a much better fit. Letter 1896 May 20 from Eliza OLIVER to her son Thomas JACKSON. William OLIVER NEED TO CHECK transcription. Andrew Coulter BRADFORD (1788-1847), an uncle who was most likely born and died at Cavananore. James HANNA. I would assume he was either a brother or uncle of the bride. NOTE: This is a lease that I have yet to find. By the time of Griffiths valuation, the OLIVERs are no longer leasing in Brootally. An acreage of this size is leased by Maxwell CLOSE to a Matthew GRUMLEY. The only OLIVER presence in Killylea at the time of Griffiths Valuation is a Martha OLIVER who leases a house valued at £1.0.0. The only acreage close in size to the one that James OLIVER had at the time of the marriage settlement is leased by a James BROWNE from a William J. ARMSTRONG (a major landlord in the townland). James OLIVER. There was a will probate for a James OLIVER of Brootally, a farmer. I suspect he was also a linen draper. William OLIVER (d. 1854) was an uncle of Andrew Bradford OLIVER. Martha OLIVER of Killylea – I have yet to determine which one she was. Martha Eliza OLIVER. For starters, depending on which document we look at, we have a range of possibilities to determine Martha Eliza OLIVERs birth. In her daughter Mary Jane's birth certificate, she is 22 years old on September 1st, 1869, hence born sometime in the year before September 1, 1847. In her marriage certificate, she was age 21 on February 20, 1864, hence born sometime in the year before February 21, 1843 (could be 1842-1843). On her death certificate, she is listed as age 28 on November 26, 1872, hence born sometime in the year before November 26, 1844 (could be 1843-44). If we can assume that one of these is right, I think we can discount her age as given on her daughter's birth certificate. Otherwise, she would have been a mere 17 years old at age of marriage - and already so far from home. 21 (or close to it) makes more sense (although what took her there is most interesting - whatever that was! I do wonder if the Henry NORRIS, father of George, may have also come from Armagh. 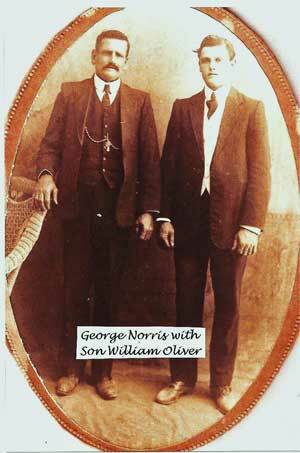 There were lots of NORRIS families in the same economic class as the OLIVERs at that time in Armagh. She may have come over as a domestic). There is a potential overlap between Martha's marriage and death certificate so that it is most likely that she was born in 1843. Her parents married March 22, 1843. This could mean many things. It could mean that Martha's birth may have been after the marriage and also conceived post marriage or it could have been a post marriage birth that was conceived pre-marriage or else it could have been a birth that preceded the marriage (sometimes in those days, they waited to see if the infant would live - and bear in mind that Andrew Bradford OLIVER had no living parents to guide him at this time and would have been about 25 years old while his wife was 21). Their marriage agreement was quite detailed, so I would assume that both her family and his trustees would have been onside. Given this, my guess is that the birth of Martha Eliza happened after the marriage and that she was their first born. Aughrafin is on the eastern border of Killylea, Parish of Tynan and is also a few townlands south west of the townlands of Ballyscandal and Terraskane which were townlands which were at least historically connected to her parents. It is also just a couple of townlands north of Brootally, a townland where the OLIVER family had farmed for at least the last century. Moses DALY. Probate of the Will of Moses Daly late of Ballybrockey County Armagh Farmer who died 14 April 1917 granted at Armagh to Patrick McKenna Farmer. Effects £634 . Age 66 in 1911 Census. In the same household was Brigid age 54 (she was married 24 years and had no children – presumably the next two are Moses children from a previous marriage), Owen age 24 and Alice age 26. The family was Roman Catholic. Ballybrocky, Parish of Eglish is a townland just one removed south west of Ballyscandal. The DALY family were small leaseholders there in the time of Griffiths valuation.The townlands of Ballybrocky & Ballyscandle are separated by a small townland named Garvaghy. They are just south of Mullintur & Tullysarren, two townlands that figure in the OLIVER families of the early 1700s. The same thing happened with the ten children of Thompson BROWN(E).